Joan Schulze has been a visiting artist/lecturer in Australia, Canada, The Netherlands, and Luxembourg and throughout the USA since the 70's. She has been the keynote speaker for many conferences and symposiums sponsored by the San Diego Museum of Art, the Textile Arts Council at the De Young Museum, Wake Forest University, Winston-Salem, North Carolina and the Honolulu Academy of Art, Oahu, Hawaii to name a few. Some of her more recent installations in the Bay Area are at the Gateway Center, Adobe Systems World Headquarters and Queen of Apostles Church in San Jose, CA. The National Museum of American Art, Renwick Gallery/Smithsonian, Washington, D.C. has acquired two of her artworks. 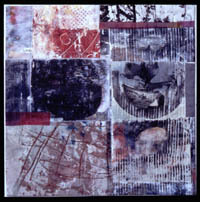 Publications such as The Art Quilt by Robert Shaw, 1997, 88 Leaders in the Quilt World Today, Japan, 1995 and World Quilt '98 at the Tokyo International Forum have featured her quilts. Joan Schulze has been a juror for the prestigious Quilt National and has won awards in this and other major international competitions. Joan has a one-person exhibition of her work at Galerie Smend in Cologne, Germany, September 9, 1999. This exhibition will travel to The Danish Textile Museum (Textilforum) in Herning, Denmark Dec. 17, 1999 through February 24, 2000. Her recent book, The Art of Joan Schulze, published by Dustom & Limited Publications, San Francisco, California, investigates her development as an artist who creates quilts, collages, paper/silk constructions and installations. The urban experience colors the way I look at the world. My choices in creating a piece usually come from my travels and can be read as pages in a journal. I am enamored with surfaces and how they disintegrate over time. I layer and scratch away to reveal what is beneath the surface, much like the effect one sees o old frescoes, illuminated manuscripts, and urban walls. These erasures and fragments are combined, manipulated and rearranged as I work. I love the idea of quilt. The layering, the fact that it can be reversible, that you can plug into this great and varied history of bed coverings and with a little push you can enter a new world of walls, ceilings, or installations. It is the best of all worlds for me. Quilting now functions as drawing with echoes of the tradition. 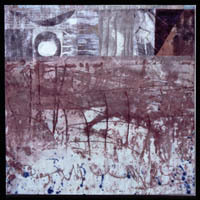 It is as varied as there are artists who use fiber as their medium. There are still places where fiber and/or textiles are not considered a serious medium worthy of critical discourse.